Four years ago I read five books in around five months. George RR Martin's 'A Song of Ice and Fire' opus consumed me utterly. I lived and breathed the books by day and dreamt of them at night. On the 12th July the next in the series is released and because four years have passed I thought it best to refresh my memory. 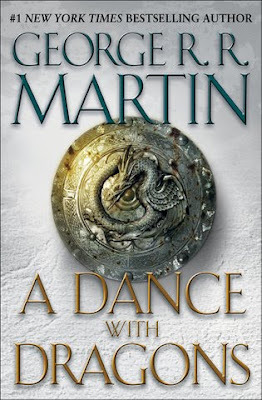 It was a little odd reading A Game of Thrones as the TV series began on television but moving on to a Clash of Kings has been a joy. It's the depth of the world that Martin's created that never fails to amaze and his fearlessness in taking a major character off of the board (with a violent beheading...). It's graphic, far more so than the TV series which has shocked a few in itself and dark. Very dark. The mission then is to nail at least four of the books by the 12th July. The fifth can wait as it's at that point that Martin was forced to split the timeline in two. The new book will be set in exactly the same period as the last but be focusing on the characters that weren't included. Which means that in some respects we still have a very long wait to see what happens to the characters from A Feast for Crows but then that didn't have at least three of the big players in it. Between gaming, going to the cinema and writing for here, not to mention working and tweeting, life is feeling pretty crammed. But the reading thing is great for the not smoking thing and at the moment that's pretty crucial. If I can get to the end of A Storm of Swords (books three, split into two books) that will mean that I'll be in middle of July with over ten weeks of not smoking behind me and a new book by my favourite author in my hand.